This post is a little late, yes its true. A crazy work schedule will do that to a person. The NHL season is under way and teams are beginning to take shape. Streaks, good and bad are making themselves known. Has your team made it into the win column yet? Has your favourite player been struck down with a long-term injury? Do you understand the new rules…or new penalties[concealing the puck!]? Are you tired yet of hearing about the band-wagoners? Have you had any luck at getting to the arena to see your team play? These are just a few of the story lines that are affecting all the teams as the season is now in session. Getting back to business regarding the Canucks, they have had many story lines of their own. David Booth is out for another 4-5 weeks with a groin strain. Kesler is expected back on the ice within the next week [but his return to the lineup is still a few weeks away]. Zack Kassian has become a sensation with the fans due his consistent play and beauty of a shootout goal to WIN the first game for the Canucks. 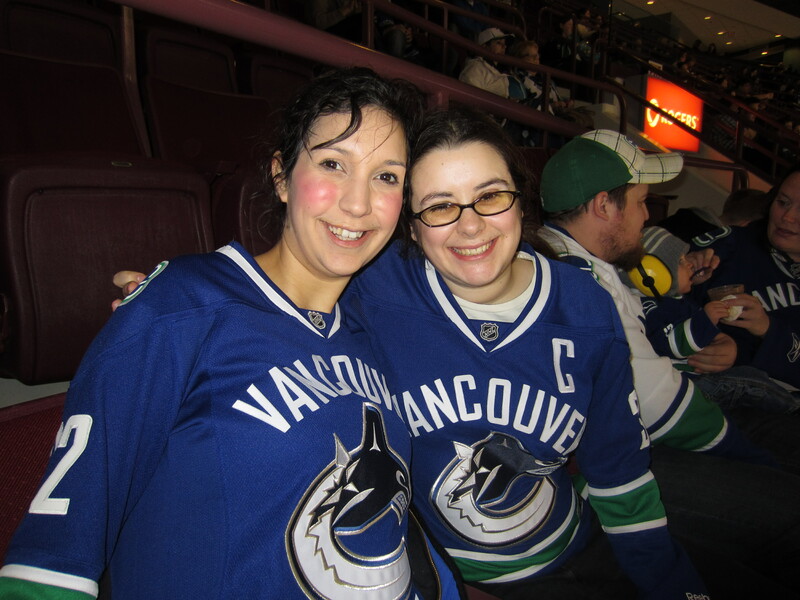 Yes, my Canucks made it to the win column and I was there to see it live in the arena with my mom and sisters. There is something special about being in the arena when your team earns their first WIN of the year. You all know how much I love watching the game…and when the chance to see the Canucks play live at Rogers Arena came up…how could I say no?! January 23rd the Canucks played host to the Calgary Flames. We arrived and people scattered throughout the arena as slowly people made their way to their seats. 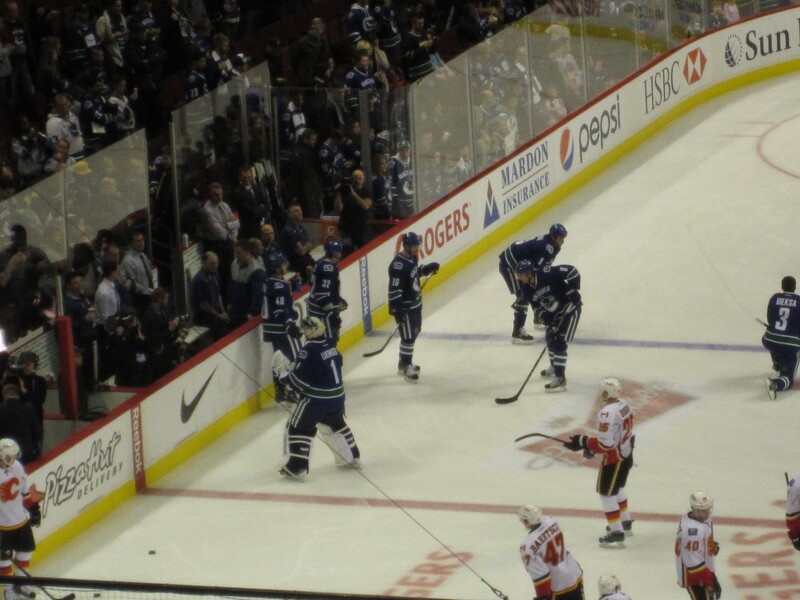 Just before the clock struck 6:30 the Canucks and Flames hit the ice for pre-game warmups. Canucks/Flames pre-game warm-ups January 23rd 2013. Do you recognize some faces? 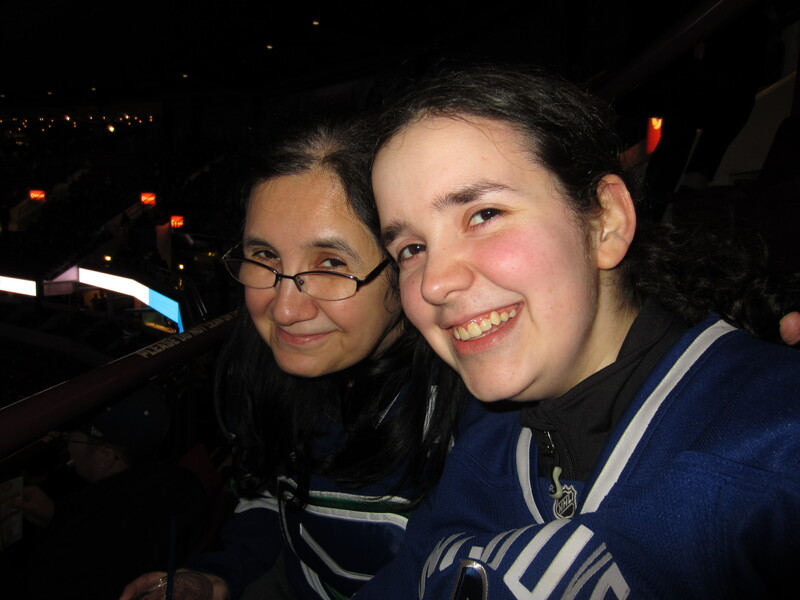 Not to be left out of the fun…the two biggest Canuck fan there are….my mom & me! Now back to those band-wagoners. I don’t know about you, but I hate being called a band wagoner or asked if I’m back on the bandwagon now that the lockout is over. No, I am not back on the bandwagon, I was never on the bandwagon. I never stopped being a fan of the game. Was I a fan of the lockout? No, but I was still a fan of the game that is hockey. I also never stopped being a fan of the team just because they were not playing. So no, I am not back on the bandwagon…the bandwagon is reserved for those who cheer once in a while, only during playoffs, or those who cheer only when things are going well. 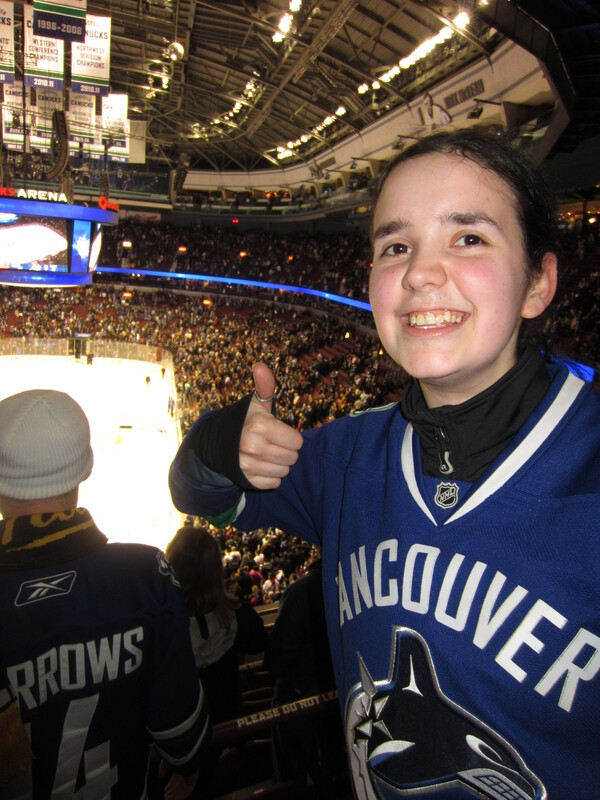 This kid is fan through and through of my Canucks, win or lose, every game, every season. P.S. Last night the Canucks had a rematch with the Ducks in Anaheim. My #Canucks played their first road game and dominated. They ruffled some feathers…and stole a victory from the home team by the score of 5-0! After being embarrassed in their home opener by the Ducks….the Canucks were looking to spoil the Ducks home opener and did just that. Heck…their powerplay was unbelievable as Anaheim got into some penalty trouble[ahem….Corey Perry]! 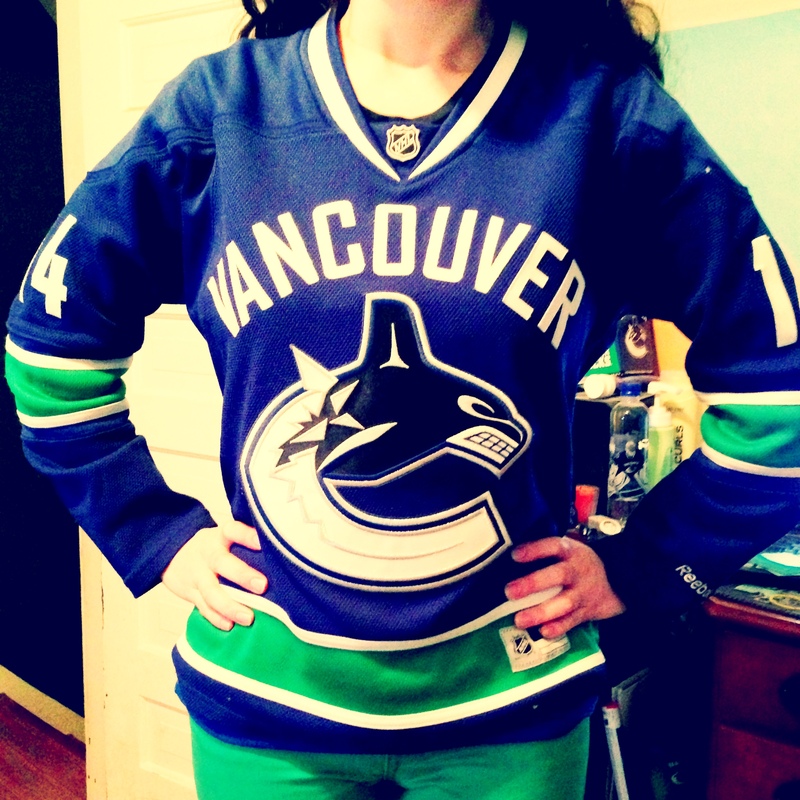 #GoCanucksGo! Well faithful readers, we survived the lockout. The 2013 NHL season is officially begun. Training camp is underway. Game day is fast approaching. 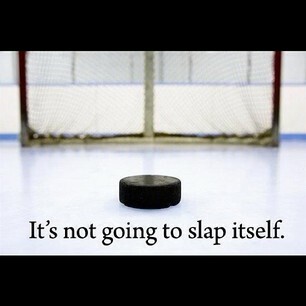 My Vancouver Canucks and the other 29 teams are all back on the ice!!! Each day brings new surprises for the fans and media alike as each team announces signings, trades and surprises for their home openers. Each day the whispers of anticipation of the first games grow louder. Fans and media are eager to prove their opinion is the one to listen to regarding the upcoming season. – Luongo, where will he play? You all know how I feel on this issue. I am disgusted by the media and certain fans who blame him for all things. I would be extremely disappointed to see him playing anywhere else, but wherever he plays [Vancouver included] I hope he has a fantastic season. -Who will fill in the void left by Ryan Kesler? Kassian, Schroeder, Hansen or perhaps even Raymond? According to Mike Gillis, that spot will not be available for too long. Kesler is competitive and has never enjoyed being on the sidelines. -Will Chris Higgins and David Booth be able to stay healthy for the majority of the season? If so, how many points will they put up? Will they eventually reunite with Kesler on the All-American Express line? -Tim Thomas. Oh, the ever controversial Thomas. He has decided to continue his year of solitude in Colorado away from all things Bruins and hockey. His backup Tuukka Rask will assume the #1 starter position in the Bruins net for the 2013 season. Thomas has however told the team that he will be returning for the 2013-2014 season….really? It will be interesting to see how his team will respond if he does come back next season. -Chris Pronger. Will or won’t he retire? This one is a difficult one for the Flyers to address. Pronger is their team captain, an impeccable leader on and off the ice.If he does retire, it means being forced to leave the game instead of on his own terms. The whispers are definitely getting louder on this issue as more and more reporters speculate Pronger retiring, and Philadelphia has yet to confirm one way or the other. -The Maple Leafs. So many questions. Now that Burke has been fired, what will Nonis do differently? Will he be able to address their goal-tending issue before the end of the season? Will Kessel and Lupul be the dynamic duo they were last season again and if so, can they both stay healthy? Will the team make the playoffs in 2013? -Scott Gomez has been officially let go. He was sent home by the Montreal Canadiens prior to the start of training camp. They will buy him out in the off-season. In other Montreal news, they have yet to secure P.K. Subban to a new contract. He cannot officially report to camp until he has signed on the dotted line. -Will the Staal brothers now united in Carolina, be able to lead the Hurricanes to playoffs for the the first time since 2009? -Can the LA Kings have the same success they had last year with Coach Sutter and goalie Quick? -Will Ranger Nash be the missing puzzle that New York has been looking for? -Will the young guns in Edmonton bring the city back to a ‘city of champions’ era? -Just how good will a 100% healthy Sidney Crosby be? Will he be league MVP once more? With all of these questions, time will tell. Many more issues will come to light in the coming days leading up to the opening game of the season. I look forward to all the story lines that are still come as the season begins. As always, until next time, nuck said. P.S. 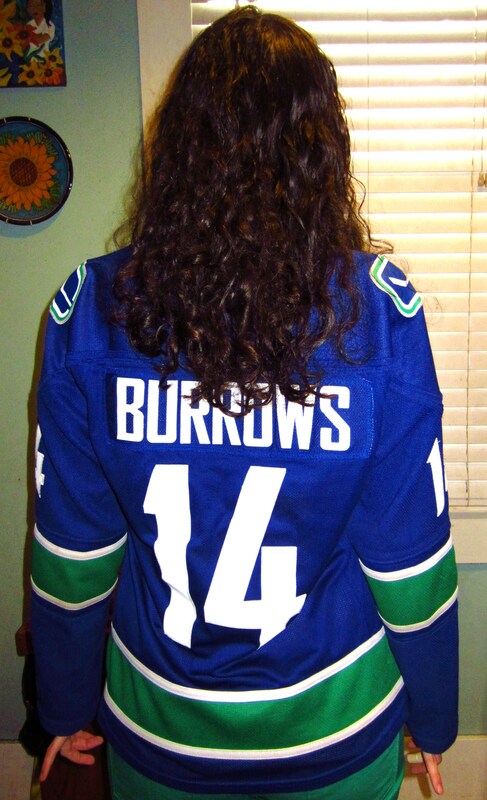 Bonus reading for the week: Below is a link to one of my favourite Canuck/hockey blogs. A post from today was quite enjoyable. It’s an interesting look at Luongo’s stats…and if you keep up with my posts, you all know how much I love the guy as a Canuck! It is officially time to drop the ceremonial puck now. The NHL Board of Governors voted unanimously to ratify the new CBA and the players are expected to officially ratify the new CBA by Saturday evening….and training camps are open on Sunday. Following the ratification of the NEW CBA, Gary Bettman addressed the media. What stellar media bite did he share with the public? An apology. Yes, an apology. This apology was geared towards all those who did not want a lockout to happen[which is pretty much everyone!]. “To the players who were very clear they wanted to be on the ice and not negotiating labour contracts, to our partners who support the league financially and personally, and most importantly to our fans, who love and have missed NHL hockey, I’m sorry,” said Bettman. “I know that an explanation or an apology will not erase the hard feelings that have built up over the past few months but I owe you an apology nevertheless.” How did that sound to you? To me, it sounded as if those words came from someone else…aka someone wrote the speech for him. Following his apology, he also spoke of his confidence that he will remain commissioner for many years to come. I suppose, we shall see. The Toronto Maple Leafs have been involved in many rumours circling the league, but the most shocking move they have made since the CBA came into reality…firing Brian Burke. Brian Burke was let go, following four years of zero playoff appearances. Most people have said they were stunned he was fired, but the owners claim it was not an overnight decision but months in the making. Just as Burke was fired, his protege Dave Nonis [yes that Dave Nonis] was named as the new General Manager of the Toronto Maple Leafs. It is curious that both Burke & Nonis worked for the Canucks together a few years back…and when Burke was fired back then, it was Nonis who was named his replacement. Nonis says that his GM style is similar to that of Burke, but he is more patient. The closer training camp gets, the louder Luongo trade and Pronger retirement rumors all around the league become. The CBA will be ratified by tomorrow evening and as training camps open, teams will try to win back all their fans. Pittsburgh is having a few contests through their social media outlets as well as offering each fan attending the first 4home games: up to three free concession items and 50% off all Pittsburgh merchandise. Nashville is offering fans 2 for 1 tickets for the first game. 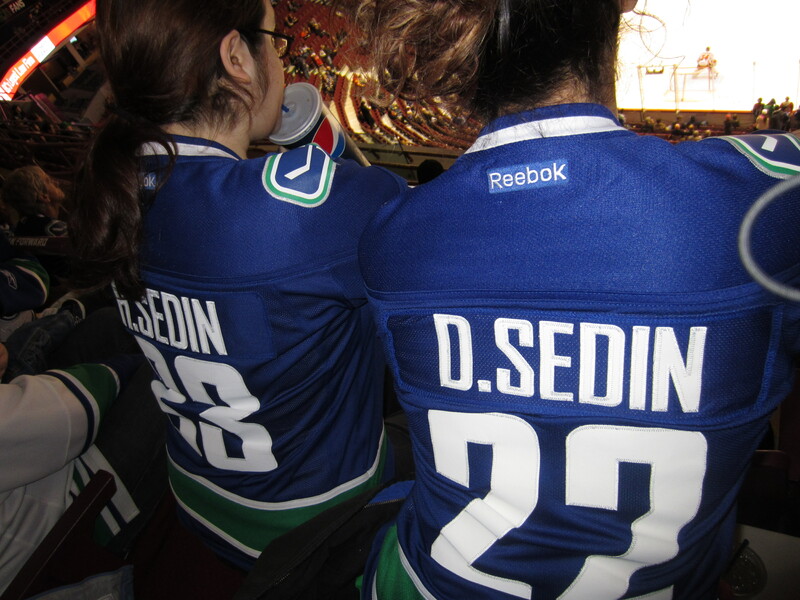 The question remains, what will the Canucks offer to win back fans? What will the league offer to win back the fans that they drove away[following the last lockout, they created the shootout]? Teams are still waiting to find out who their first opponents will be as the regular season schedule won’t be released until this weekend. All I know is regardless of who the Canucks play, that this kid is looking forward to digging out the jersey and getting pumped for game day next Saturday [January 19th!!!]. 30 teams are getting themselves ready for #gameday as the time to drop the puck is nearly here! In case you missed it….the NHL and NHLPA came together yesterday in 16+ hour marathon negotiation with mediator Beckenbaugh[this guy had immense pressure to get these sides together!] and announced that a NEW CBA HAS BEEN REACHED. THE NHL is back on ICE!!!!!!!!! I told you all that there was still room for optimism!!! I told you all that I thought there was always hope for a season this year….and guess my optimism has paid off! No more ‘lockout’ heavy blogs. The game has simply returned! The new deal presents a 10-year duration with an opt out option in after 8 years. That means 8 YEARS before another one of these CBA sagas again[although they should probably begin dealing with it before the end of year 8!]. The new deal also brings with a 50[or 48] game schedule…depending on just how soon the season can get underway with quick camps. Keep your eyes on January 17-20th for opening day!!! Game on boys!! Cannot wait for all the ups and downs that come with an NHL season!! Here’s to a memorable 2013 NHL season in more ways than one! More details are sure to come in the next few hours and coming days! The NEW schedule will soon follow, as soon as I know I will add it to here! Until next time, as always, nuck said. Let me start by saying I hope that everyone had a wonderful Christmas and New Years! Adios 2012. Hello 2013. The 2012-2013 NHL Lockout has now surpassed 100 days. As 2012 came to a close…the NHL has made yet ONE more FINAL offer to the Players. Funny how each time a new offer is made..Bettman calls it the FINAL offer. Following each proposal there is usually a counter proposal. The sides have been in constant contact since the new deal was suggested and are supposed to met together yesterday and today. The latest reports suggest that a new deal MUST absolutely BE in place by January 11th in order to get the minimum 48 game regular season in place + playoffs ending by the end of June. It was expected that NHLPA would respond to the NHL’s offer yesterday with a counter proposal of their own. They did. We shall have to wait and see how that turns out….all signs point to they BOTH need more time to review and discuss. Great…more waiting! Just what we all wanted! There are many who claim they could care less if hockey returns after this latest round of cat & mouse that the league and PA are currently trapped in. There are a few NHL analysts that still hold out a faint[very faint] hope that a deal will be struck by the 11th. One of those analysts is the ever colourful Don Cherry who has taken to twitter tweeting his belief that the NHL will be back ice mid-January. I admit [as always] that I would LOVE if that occurred but it really comes down how far Bettman is willing to lose just to make his point [in the end, it might be more costly to him than he can guess. Rumor has it that this could mark his last year as Commissioner]. – 2012-2013 opening day of the NHL season and all the games prior to & on January 14th. – 2012-2013 All-Star game & all the festivities that come with it. – All of the ups and downs that come with an NHL season for each player individually and each team separately. There are always streaks [good & bad] throughout the season that make it unique and draw comparisons to previous years of previous players. In other news…have you been watching the World Juniors taking place in Russia? Have you seen Ryan Nugent-Hopkins stealing the show? He has so far led Team Canada through an undefeated preliminary round…sending them into the Semi-finals! Go Team Canada![p.s. the U.S. team is looking pretty good too!] World Junior hockey is a great outlet for those us who are missing hockey. It gives us those lovely moments to yell at the refs for making bogus calls, yelling at the players when they make a mistake or dissing the opponent and cheering like crazy each time your team scores a goal. Yes, World Junior hockey is great for any hockey fan, but it ends as quickly as it begins and each game leaves me wanting to watch the game I have been missing since September. I don’t care how it happens, I just want to be able to watch hockey again. 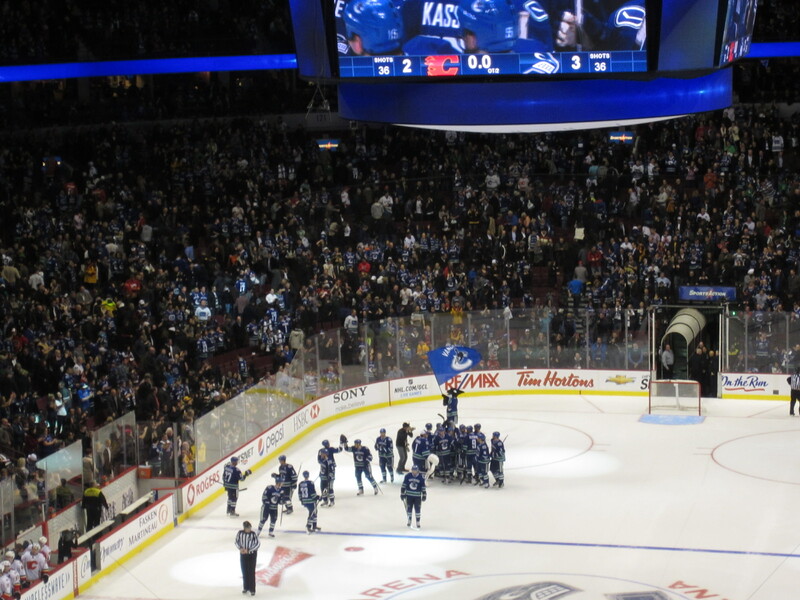 I want to see my Canucks hit the ice at Rogers arena just as many of you [though you might not admit it at this moment] want to watch your team hit the ice in their home arenas. I am tired of reading the local papers [Vancouver Sun/The Province] attempts at creating hockey story lines during this lockout…it drives me crazy[specifically those jabs at Luongo…!] Their constant negativity is what drove me away from buying their papers and keeps me from buying them now. Each article seems to push fans against the home team rather than support them. That is not a paper that I want to read. I would rather read a paper that supports the team WIN or LOSE. It can report the BAD and the GOOD….not just the bad.] Apologies for my rant…but I was reading the paper at work the other day and the story made my blood boil…that is all I will say. Moving on, back to the lockout that has seen no end [YET]…we shall have to wait and see the results of this latest NHL offer and PA counter as it unfolds. As always, until next time, nuck said.